Egg Harbor Ale Fest, Egg Harbor, Door County, Wisconsin. Photo by Len Villano. 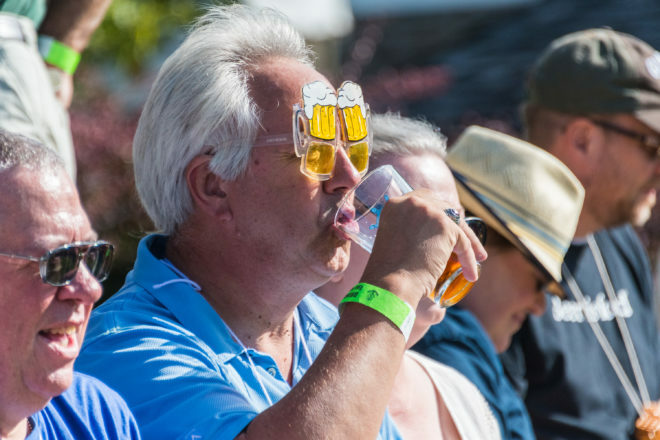 Enjoy craft beers from 40 different brewers at this year’s Egg Harbor AleFest. There will be more than 100 different craft beers to sample. Bring friends for a fun day of tasting and sampling. The event runs 1-5 pm at Harbor View Park, with early admission at noon available to VIP guests. Join the fun and listen to live music from noon to 5 pm featuring In Black ‘n White – a Wisconsin reggae, rock ‘n soul band. Visitors can also catch guitarist and vocalist Joe LaForce throughout the afternoon. Tickets are available to purchase online at eggharboralefest.com or at the door the day of the event. VIP ticket holders have access to the grounds at noon, unlimited craft beer samples and food, and receive a commemorative glass stein. General admission ticket holders can enter the grounds at 1 pm, receive unlimited craft beer samples, and a commemorative pint glass. Designated drivers receive a discounted ticket, complimentary shirt, soda and bottled water. Food will be available to purchase as well. Complimentary trolley transportation will be available from 11 am to 7 pm to/from Egg Harbor lodging establishments, restaurants and AleFest grounds. Tickets are $50 general admission, $100 VIP and $15 for designated drivers or non-drinkers. For more information visit eggharboralefest.com.